On January 14, 2016, ACE Limited acquired The Chubb Corporation, creating a global insurance leader operating under the renowned Chubb name. The new Chubb has officially been named the world's largest publicly traded property and casualty insurer, but these changes haven't stopped the company from delivering exceptional property and casualty insurance products and services to businesses and individuals around the world. 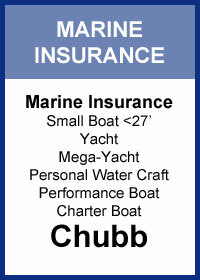 We at Chubb pride ourselves on protecting the emotional attachment that clients have to their assets. We understand that these assets have a value beyond dollars and cents and that in the event of a loss, you'll want more than just a check from your insurer. The new Chubb still guarantees that we'll do our best to make the damage go away, but in the event we can't, we'll rebuild or repair without hassles, headaches, or delays. The new Chubb will continue to offer the Masterpiece contract for all new clients - a contract which has long been considered the gold standard for the affluent insured1. Offering coverage for homeowners, valuable articles, auto, liability and yacht, the new Chubb is committed to providing continuous product updates and new offerings that best meet the needs of high net worth consumers. What is Family Protection? It's a product developed to help cover certain costs if an insured or an insured's loved one is the victim of a home invasion or air/road rage, child abduction, carjacking or a stalking threat crime almost anywhere in the world. Coverage for this product starts at $70 per year, but prices vary by state. With the 8.0 revision, Family Protection is now including a new Cyber Bullying Coverage in which customers can be reimbursed up to $60,000 in the recovery of a cyber-bullying occurrence. The coverage pays for psychiatric services, rest and recuperation expenses, a PR professional to help repair reputational damage and a cyber-security professional to help build a strong legal case if the matter is brought to court. It will also pay for lost income or tuition fees if the customer has to miss work or transfer schools. 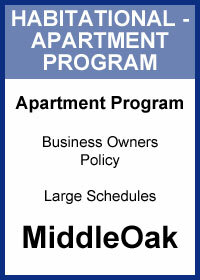 Additionally, it will cover temporary relocation cost if the customer has to leave their home to avoid harassment. As the leading insurer of fine homes and possessions, we not only want to help protect the thing you treasure most; we also want to cover the people who are most precious to you. New clients to Chubb will be written on Masterpiece paper while and any legacy-Chubb policyholders will continue to renew on Masterpiece paper as well. Conversely, any legacy-ACE policyholders will continue to renew as expiring on their Platinum Portfolio contracts despite being under the umbrella of the new Chubb Corporation. Please remember that per the U.S. Business Placement Plan for Personal Lines, Family Protection can only be sold to customers with a Masterpiece or Texas Platinum dwelling policy. Legacy-ACE policyholders must utilize the Family Security Coverage option available via endorsement for $100 annually. 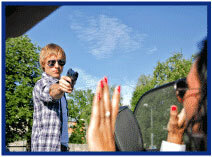 Family Protection is NOT currently available in AK, HI, IA, ND, SD, VA or WY. 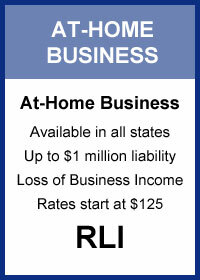 Most new U.S. businesses start at home, so you likely have clients with a home business exposure you don't know about. And thanks to a new online submission process and online direct bill payments, submitting business with the Big "I" RLI Home Business Program is now easier than ever. In Property Casualty 360's recent article, InsurBanc's Chief Lending Officer, Robert Pettinicchi gives insight into three questions bank lending officers often receive. In this article, Robert provides his observations on the interest rate environment and agency valuations. With the Federal Reserve Board's recent decision to raise low interest rates, how will this affect rates paid by borrowers? 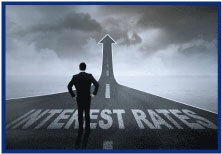 Robert discusses how agency borrowers will be impacted and what he expects of interest rates throughout 2016. If you're thinking about selling your agency, what price could you get if you sold? Learn what factors InsurBanc considers when evaluating and valuing an agency. Are agency valuations at their peak? Read about values being paid for independent insurance agencies and how that may influence your decision to sell. April 20. "Pollution... You're Not Properly Insuring It! - Unbelievable Fun With Pollution Exclusions" This webinar identifies why "pollution" exposures go far beyond what you might think of in terms of hazardous materials, with the most common pollutants being fungus/mold/bacteria. An overview of standard CGL and commercial property exclusions is provided then explores an in-depth review of frequently overlooked F/M/B exposures and real-life case studies. Attend and learn the importance of recognizing the exposures and choosing the appropriate environmental insurance product. Click here to learn more and to register. Why Has Industry Use of Reinsurance Increased? This week we turn to a question I've never received a definitive answer to and that is, "Why does it appear that over the past 20 years or so the average percentage of reinsurance has increased?" Below in green is Gross (before reinsurance) and Net (after reinsurance share). The red line is the percentage of reinsurance and, visually, it is the gap between the solid and dotted green lines. 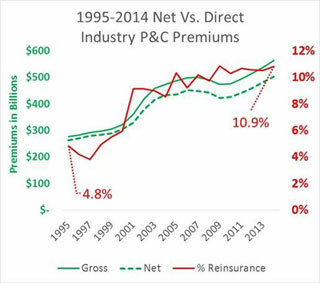 I've never heard a definitive answer on why reinsurance use has doubled in 20 years from 5% to over 10%. Look at the big jump in reinsurance utilization before the 2000-2002 hard insurance market. I can look at the same graph by Line Of Business (LOB). What's your theory? Email me at paul.buse@iiaba.net. 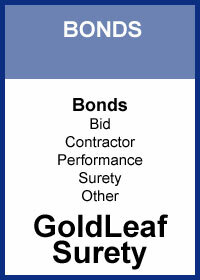 Congratulations to our agent in Michigan on a performance bond sale of $11,423 in premium!